Should An Icon of a Soldier Show Him With Fatigues, Chainmail, or a Roman Kilt? Second is dealing with contemporary clothes. 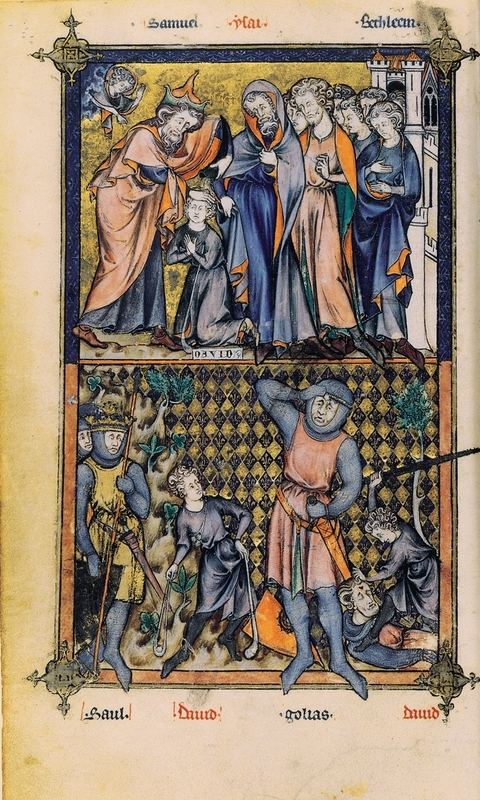 While it seems to have been fine in the middle ages to paint the soldiers of their past in contemporary chainmail because the idea of awareness of what the biblical soldiers might actually have worn was different (here's Samual anointing David and David slaying Goliath). ...I don't think it would work today. We would use historical dress. When it comes to contemporary saints, such as the 21 Coptic Christian martyrs beheaded by ISIS, the iconographer can't suddenly put them in historical clothing to give the aura of holiness but must aim to represent the clothes they wore in an iconographic way. Here is an icon by a neo-Coptic iconographer of the 21 martyrs. Notice the sensitive way that the painter has handled the faces and the clothes, to create a contemporary icon very well, even portraying the bright orange jumpsuits that the prisoners wore.